As we approach the end of 2015 I think it's natural to experience a period of reflection whereupon we may think about how this year went for us and what we would like to achieve within the next year. I feel extremely on the fence this year when it comes to new years resolutions. On the one hand I think they can be extremely motivating and the whole idea of a new year and a new you can seem really appealing, particularly if you've had a difficult year or have a list of things you'd like to change or improve on. A new year does mark a new beginning and an opportunity to put the past behind us and move on from things that may have been holding us back. I totally get why a lot us wait until the new year to make some important life changes. It's like you can plan ahead for the next year and spend more time envisioning where you want to be whilst allowing yourself mentally to come to terms with the whole idea. I do believe that a lot of this comes down to being in a certain frame of mind and embracing thinking positively. 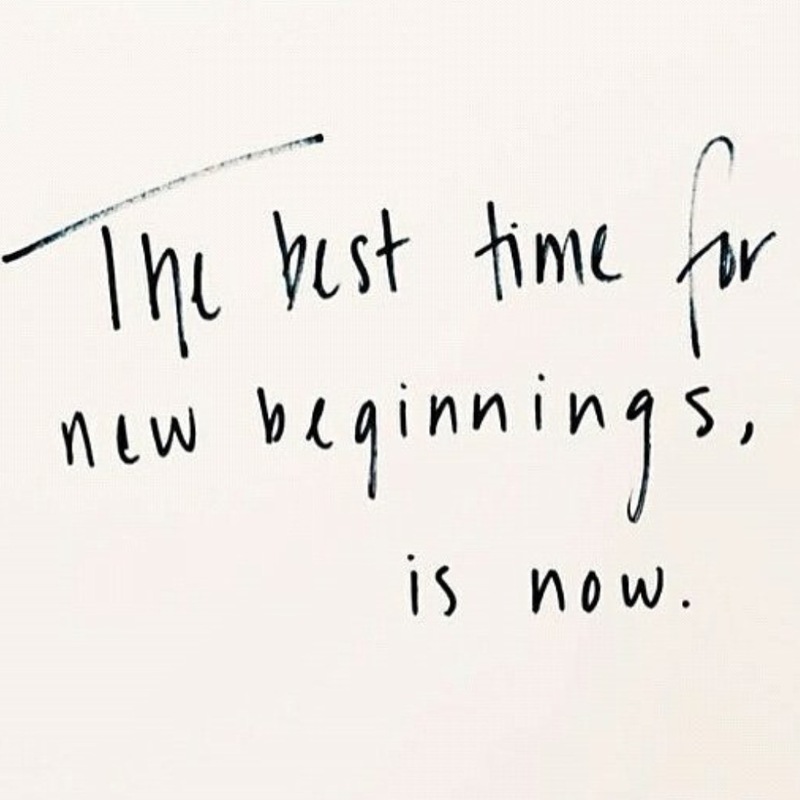 I saw an inspirational quote a few weeks ago which said 'the best time for new beginnings is now' which I totally agree with. I'm sure we've all been in the situation where we've put the diet off until Monday because the beginning of a new week feels like a fresh start. When in fact it would probably be more beneficial all round to just start the diet now! But for some reason that can feel like a far less achievable target. I keep hearing the phrase 'it's just another day' lately and the logical side of me couldn't agree more. It is just another day and the only thing that changes in reality is the date. The emotional side of me will think differently though and as much as I would like to make some changes right here and right now I know that deep down I am someone who generally achieves more if I plan, prepare and phsych myself up. I'll admit that I do need that little bit of extra motivation to set my mind to something and get my arse into gear! But am I just setting myself up to fail? I'm sure I wouldn't be alone in admitting that a lot of new years resolutions have been broken in the past and the levels of high motivation have only lasted a few weeks. But maybe that's just me!? I'm sure the levels of pressure and expectation we voluntarily place upon ourselves at this time of year isn't always healthy for our bodies or mind. Then again, maybe if you truly believe you can achieve something then you will. I mentioned in my last post that 2015 has been a real mixed bag for me. I have had some really amazing highs and I have been fortunate enough to travel to some beautiful places. My blog and following have gone from strength to strength and I'm feeling really proud of everything that I have achieved. My blog has also allowed me to make some amazing new friends in my area which has been a total surprise but one that I welcome. I really do feel like I have a great community of people around me at me moment and it's refreshing to feel so appreciated and supported. On the downside i've experienced big changes in my career which has left me feeling really uncertain about my future. I've reached a stage where I have no idea what I want to do outside of writing and photography. I know that i'd like to do something rewarding and ideally within an animal environment but i've yet to find the right opportunity. I've also experienced a lot of stress and consequently my anxiety levels have risen again which has been hard to deal with and made life feel like a real challenge at times. I think when you're in your twenties you imagine to have life completely worked out by the time you reach your thirties but it would appear that I still have a little way to go! So what are my hopes for 2016? To be honest I think i've decided that the best way forward to is to set some small and achievable goals rather than one huge challenge. I also want to incorporate things that I actually want to do and can look forward to. I think life is a constant learning curve and i'm always striving to improve upon things and better myself in any way that I can but it's still worthwhile to have some targets in mind and something to aim towards. I'd like to wish you all a Happy New Year and I hope 2016 is filled with lots of fun, laughter and happiness for all of us. Whatever your hopes and goals are for next year remember to be kind to yourself and others around you! And what ever you have planned this NYE I hope you have a great night and wake up on the 1st feeling ready to take on 2016. What are your hopes and goals for next year? I'd love to hear! I have an ambuvalent opinion about new year's resolutions, too. In fact, it's the first time since I was a child that I actually have any. I always thought that I can only fail and won't be able to accomplish them all, so I just never had any. However, I realised that if I have ten goals and accomplish only one, I'll be better off by the end of next year than if I hadn't had any goals in the first place. Therefore, I think it's a good idea to have a few hopes/resolutions and I wish you all the best in achieving them! These are very similar to mine too. Hoping to get healthy and tone up a bit (I say every year) and photography for my blog is a biggy! I resolved to do something new by taking a course last year and I'm so glad I did. I totally agree with your resolution to spend more time reading; I wish I spent more time just relaxing on the sofa with a good book but I often find myself getting restless or feeling like I'm being unproductive, which is just silly. These are cool goals. I definitely want to read more this year.